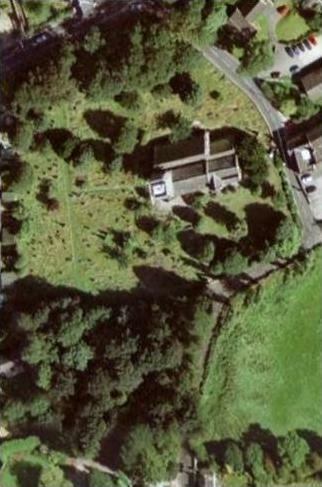 Entries in red indicate that a stone and MI are available to view on the plan as a photograph and text and were extant in the Churchyard in 2009. Here is a small section of the spreadsheet plan showing one of the MIs selected. The small red triangle at the top corner of a cell indicates that clicking on the cell will bring up a photograph, underlined entries reveal the MI as shown above when the mouse cursor is hovered over the cell. New version 29/9/2017. This is a complete revision and adds all Burial Register data available much of which is transcribed from photographs of the original records where the microfilms are unreadable due to ink fading. The Sexton records ensure that even unbaptised people are included which are not in the burial registers. The result is that this database contains several thousand records not available from other online sources. This page gives an overview of the material available to registered users who can download the files from this site. The focal point of the project is an Excel spreadsheet containing over 25,000 entries of burials in the Churchyard from the Sextons' records between the years 1674-1965. The spreadsheet also has a cross-referenced plan showing the locations of the plots together with photographs of the MI stones and their inscriptions (over 1,000 of each). A download menu off this one on the left gives access to the spreadsheet and photo files. you will see below a tiny section of the spreadsheet data containing only a fraction of the columns available. As this comes from the Sextons' records, it contains much valuable background and cross-reference information, in particular, many causes of accidental death. What an excellent site! I'm researching my family history and in 5 minutes, I've found relatives and additional information that I would never have otherwise unearthed (I don't live in Huddersfield). Thank you! What wonderful sets of data, thanks for sharing such valuable information online. Regards Wayne from Wollongong, Australia. Yes, we are related. I have sent you an e-mail to the address provided. Henry married Hannah Sheard, daughter of Matthew Sheard on 20 Sep 1829. Hannah was christened 10 June 1810 and buried 21 December 1866 at Kirkheaton St. John the Baptist. Yes and a few further back still (see the list of MIs above). Indeed, the MI of John Hirst d. 1710 still exists but I am afraid there is no record of an existing MI of your Charles Hirst. 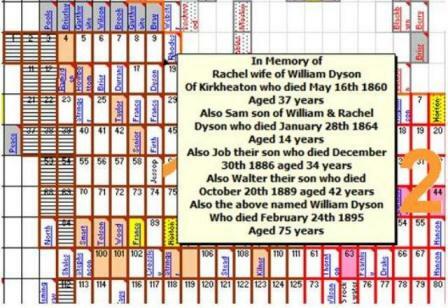 Unfortunately the sexton burial records showing burial locations of this date and earlier have not survived. If later Hirsts burial plots still exist is is possible that they were near older relatives so long as they were buried in the Old Ground south of or close to the church. My ggg-grandfather, Charles Hirst was buried at St. John the Baptist, Kirkheaton on Nov. 30, 1801. Are there any graves which date back to that period?